What Does My Self Care Routine Look Like? I don’t have a full self care routine. I normally fit in any self care when it’s wash day. I try to do some extra things that make me feel good. So I’ll take a longer bath, I’ll listen to music whilst I deep condition, that kinda thing. So what does my self care routine look like? Like I said wash day is normally a day I can spend doing all the little things I enjoy. I have started to deep condition every wash day to see if it benefits my hair. This gives me a few hours to get some small tasks done like changing my bed sheets or straightening up my room. 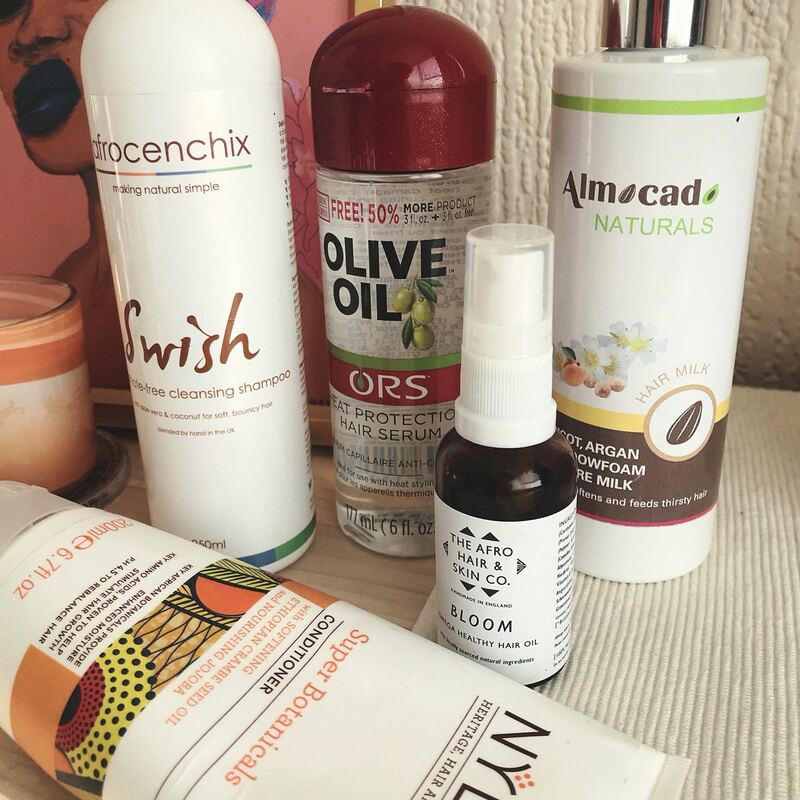 Products (Left-Right): Afrocenchix Swish Shampoo, ORS Heat Protection Hair Serum, Almocado Hair Milk, The Afro Hair & Skin Co Bloom Hair Oil and Nylah Super Botanical Conditioner. I like to put on some music whilst I’m washing my hair. During the deep conditioning and styling stage I will put on a film or use that time to catch up on any missed shows. My self care is a lot of me time, it’s the best way for me to recharge and get ready for the days ahead. I recently changed stores and I’m in a whole new department of work, it is extremely early hours however I finish super early so, I can’t really complain. This has given me more time to chill and do all the things I want to do like go to events. 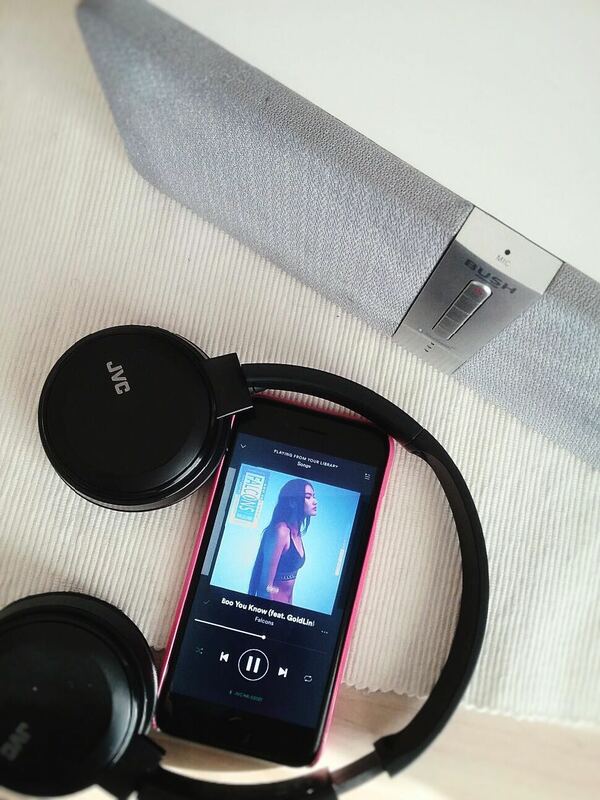 Music really helps me to relax, It is really easy for me to get lost in a good song. I either put my headphones on or blast some of my favourite songs on my speaker. A few hours of music therapy and I’m feeling good again. What I listen to depends on my mood, sometimes I want to pretend to be heart broken and sing along to some slower songs. Other times I make some poor life decisions and attempt to pop, lock and drop it… that’s what it’s called right? Or I am Rihanna whining and brukin’ my back to anything with some base. Whatever the song I have an embarrassing dance routine for it. Music is the kind of noise that doesn’t make me feel overwhelmed. I created two playlist with a selection of songs that I would recommend listening to for that feel good factor, also a few of the songs are related to self love. Normally on wash day I like to put on a face mask or I like to use a face scrub. A little extra pampering, just to give me that fresh glow. I have been using Reviving Lavender Whipped Sugar Body Scrub from The Soap Connoisseur. I purposely went for the lavender infused scrub as I thought it would also help with my sleep. I love the scent and this scrub is really moisturising. lathers really well which is a huge plus for those days when I just want to do a quick skincare treatment. I tend to use this scrub and follow up with a butter to moisturise my skin. Sometimes after washing my face and treating my skin, I will massage the cream into my face. It really helps to relax me and it’s a few moment of silence. The relationship between me and Google maps is a complicated one. My siblings even make a joke whenever we go somewhere new and I’m in charge of directions, it normally ends with my sister taking my phone and taking the lead. I recently went to an event and what was meant to be a three minute walk from Knightsbridge station turned into a fifty minute walk. Even though I was slightly lost and walking in the completely wrong direction, the walk was really nice. It’s was peaceful and calm. I was in an unfamiliar place and yet I felt clam and relaxed, I was annoyed about the fact I was an hour late simply because I couldn’t follow clear directions. Other than that I really enjoyed the walk, the fresh air and the cool breeze. Yeah my feet were burning and I questioned turning back and going home but I kept on going. Sometimes a long walk on a cool evening is great when I need to clear my mind. My sleeping pattern isn’t as good as it should be. I wake up extremely early for work and I try my best to get to sleep by 9pm whenever I can. I have moments when I struggle to sleep, especially when I have a mental list of things to do, that I haven’t even begun to work through yet. I have become slightly obsessed with my hot water bottle. I recently purchased one from Primark and now I refuse to sleep without it being refilled. 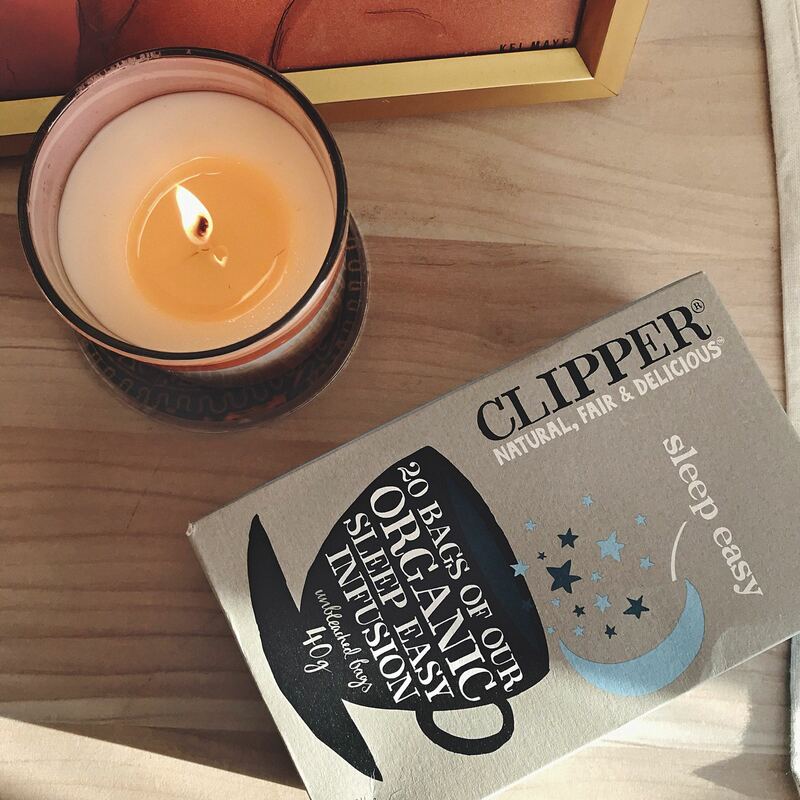 I have recently been drinking Clipper’s Organic Sleep Easy Tea. I have this tea at 6pm which gives it enough time to kick in and helps to give me that relaxed sleepy feeling that I need. Learning to give myself the permission to chill, to do things for me and to treat myself without feeling guilty. Learning to give myself the time I need to recharge, without making myself feel bad for wanting some me time. Learning to love me for simply being me. Learning to give myself the permission to take my time and to work at my own pace, without feeling like I am too far behind.